I was investing time and money in myself for the first time in my life and felt that so much of what I was learning was applicable to all small business owners and business people. Ambitious and determined, full of zest and the ability to work hard, but something was missing in my mental and emotional awareness and skills that I believed had to be understood in order for me to ensure that my business life was not summarised at the end of my life by me as “unrequited success”. I was ready for some serious self-awareness and tough talking to. As a result of this, I wrote my book, “Business is Personal” very honest and raw with the intent to help anyone who shared my frustrations as a business person. 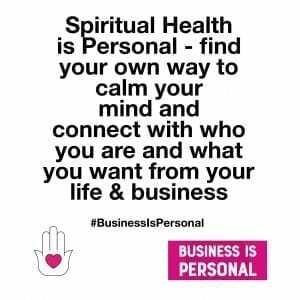 This has now given birth to my Business is Personal Mastermind. I am determined to pass on the depth of understanding that my past 20 years as a business owner has taught me. So, why have I put the words ‘spiritual’ in the heading of this post? During my year I was getting the message over and over again and with increasing decibels in my ear, that “Penny, you really have to learn how to calm your mind when business and life can and will become overwhelming at times”. I was being advised to meditate. I learned a lot about the chemistry and mechanics of the mind. I needed proof that a theory and belief I am being given had depth and factual evidence of its benefits. Meditation, was not for me, (not yet). But mindfulness- I like that. In fact, why did I turn to playing ‘Solitaire’ whenever my mind was struggling to relax? The fact is, that was my unconsciously clever way of giving the dialogue in my head peace. My light bulb moment was this – If I got up every day and went on a running machine, with a 5.0 incline and expected to fast walk at 6.5 everyday, then for sure, my body would collapse. This is what I learned the hard way about my mind. I am sure many people that read this will be on their own journey of this discovery. I am not as late as some, but a lot later than many to believe in this. perhaps you could share your story in the comments here.. motivate us all to create this mental fitness habit. We all need it. Connecting with who we are and learning to honour that, well, I now know that as a result of this and many other lessons I learned, as a Business person, I am more whole now than ever before.